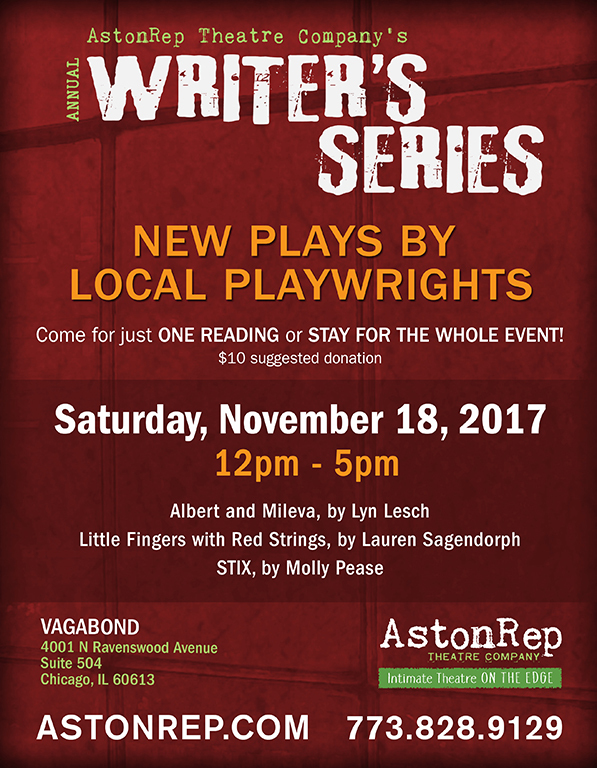 AstonRep Theatre Company is pleased to present its 9th annual WRITER’S SERIES, a daylong festival of staged readings of new works by local writers. This year’s series will showcase three productions on Saturday, November 18, 2017 from 12 pm – 5 pm at The Vagabond School of the Arts, 4001 N. Ravenswood Ave. #504 in Chicago. Patrons are invited to attend individual readings – or stay for the entire event. Readers are free – no reservations required. For additional information, visit www.astonrep.com or call (773) 828-9129. As Albert Einstein develops his theory of relativity, he and his wife Mileva are growing apart. Michele Besso, a long-time friend to both, acts as an intermediary. The play draws parallels between Einstein’s relativity theory and the couple's evolving perspective of their relationship. They are not only moving apart from each other in space and time, but perceiving their relationship differently as their marriage proceeds. Camryn is a strong but unfocused college student drifting through her life. Her career-driven boyfriend tries to support her but somehow makes her feel lamer by comparison. It takes a real spark in the person of Ellie, a 65 year-old student of life, to shock Camryn out of her daydreams. Ellie introduces Camryn to a world of art, community and passion that sets her on a path to a successful career as an artist in her own right. After six years on a deserted island, Natalie is rescued with her companion, a large piece of driftwood named Stick. But when Stick (rebranded STIX) becomes a media darling back in LA, Natalie has to learn how to survive all over again. Stix is more than just a comedy, it is a deeply relevant piece of social satire which explores movement, survival and our misplaced worship of celebrities. Lyn Lesch (Albert and Mileva) was founder and director for 12 years of The Children’s School in Evanston. A progressive, democratically run school, it received widespread attention in the Chicago print and electronic media as a unique approach to education. He has written four books on education reform, published by Rowman & Littlefield; all of them stressing the importance of what occurs inside a student while he or she is learning. He is now working on a book concerning consciousness expansion in the digital age, and recently finished work on a play concerning nihilism/terrorism in the modern world relative to the writer Dostoevsky. Lauren Sagendorph (Little Fingers with Red Strings) graduated from Indiana University with a BA in Theatre and Drama with a concentration in Acting and Playwriting in 2016. She is currently working as the Education Programs Manager for the Milwaukee Repertory Theater. Lauren considers herself a playwright, actor, administrator, educator and model. Molly Pease (STIX) is a queer southern comedy writer from Atlanta, Georgia. She holds an MFA in Writing for the Screen and Stage from Northwestern and Bachelor's degrees in Public Relations and Theatre from the University of Georgia. Molly has done pretty much every form of comedy. During her time at Northwestern, she created original sitcom pilots, plays, screenplays and a sock puppet web series. She helps produce the annual showcase Queergasm at Northwestern. Her full-length play STIX received a stage reading at Northwestern in Spring 2017. Her feature length dramedy Can I Finish? won second place for the Krevoy Screenwriting Award. AstonRep Theatre Company was formed in the summer of 2008. Since then, the company has produced 19 full-length productions and eight annual Writers’ Series. AstonRep Theatre Company is an ensemble of artists committed to creating exciting, intimate theatrical experiences that go beyond the front door to challenge audiences and spark discussion where the show is not the end of the experience: it is just the beginning.